Kei au te Mataika ! The first fish was the first enemy or the first unfortunate to cross the path of a war party. This first fish was then ritually slain and the heart roasted and eaten as an offering to Tumatauenga. Taputapuatea Marae, an ancient stone marae on Ra’iatea in Eastern Polynesia is said to have been in times past the main marae for all of Polynesia. At Taputapuatea for a long time there was a practice of human sacrifice. When the marae was renovated 5000 human skulls were found in the main altar. Close to the main marae is a small stone structure or marae which is thought to be where the human sacrifice was enacted. Sacrificial offerings were brought to the marae as part of the ceremonial ritual. They were both men and fish. At a great hui all the waka would arrive at Taputapuatea carrying their offerings laid out on the deck of the waka; first a man, then a big fish like a shark or tuna, then a man, then a fish, and so on. The offerings would then be hung in the trees at Taputapuatea, offered to the god of war, Oro. There is also a story of a chief and his son who went fishing, and as was required they were meant to offer the largest fish of their catch at the marae. But the son convinced his father to keep the largest and offer another, which they did. But the priest at the marae saw through their deception and questioned them. When they continued to lie he decreed that they would become the offering and they were hung in the trees. The offerings were called “long-limbed fish”. It is interesting to speculate that perhaps this practice at Taputapuatea, and at other marae throughout Eastern Polynesia, might have been the source of the pepeha “Kei au te mataika”. “Given a choice between their worldview and the facts, it’s always interesting how many people toss the facts”. What is the Maori worldview? Does my worldview represent the Maori worldview? Does yours? In a previous essay, “The Evolution of Pakeha Culture”, I wrote about how the Maori worldview had been transformed and shaped by contact, adoption and adaptation of European culture. In this essay I will look at some of the facts to discover just what the Maori worldview might be in the 21st Century. It might be a difficult task. The Maori elites in academia, education, politics, public service, and in the burgeoning Maori business and services sector (including neo-tribal corporate iwi) promote their worldview as the Maori worldview. It is broadly based on cleaving to “traditional” tikanga values, incorporating them into their various fields of endeavour, and on speaking Te Reo Maori. For instance the Kaupapa Maori model of research developed by Professors Graham and Linda Smith is now the standard research model in the universities and elsewhere. Matauranga Maori is the new academic epistemological niche in which many Maori academics now ply their trade. Many of the elites in the Maori business sector (grandiosely named the Maori economy) proclaim a Maori model of business and business management based on tikanga. In education many assume that Maori medium education is the model that represents the Maori worldview. These elites however comprise just a fraction of the Maori population. The assumption that the rest of the Maori population follow their lead and accept their version of a Maori worldview needs to be tested for it is of vital importance in the making of Maori policy for all Maori. We need to look at all Maori rather than at the dominant Maori elites and their proclaimed worldview. 598,605 (89.5%) of those identify as Maori. We are of at least one other heritage as well as Maori. In 2006 98% of Maori declared that they were Christian indicating that one of the foundations of the modern Maori worldview if it exists is a transplanted European religion which has its roots in a Middle Eastern tribal mythology. To find out what percentage of Maori really know their whakapapa we would need to know what percentage of Maori know which hapu they belong to, and it will certainly be a lot less than 81.5%. Official statistics focus on “iwi” affiliation which is a modern inaccurate measure of whakapapa affiliation (see The Mythology of the Whanau Hapu Iwi Construct). Only 2.3% of eligible Maori students are enrolled in Maori medium education, meaning that 97.7% are enrolled in mainstream education. As at 24 July 2013 there were 256,212 people (55.7%) enrolled on the Maori electoral rolls and 203,640 people of Maori descent (44.3%) on the General roll, a total of 459,852 registered electors. As at December 2013 the Maori Party is polling at 1.3% and the Mana Party at 0.9%. 9.7% in the Wellington region. To many Maori whanau Australia and New Zealand are now virtually the same country. Most adult Maori are earning less than the minimum wage and considerably less than a living wage. In my whanau and hapu we have some who have made it into the middle class, some who live in poverty and many in the middle who struggle to make ends meet. I imagine that we are representative of Maori society as a whole. There are also many single mothers, a status that almost always consigns them and their children to the ranks of the poor or struggling. that growth in inequality has fallen disproportionately upon Maori. For a family of 1 adult and 1 child it would be about $16,000 per annum. Maori make up about 33% of all working age welfare beneficiaries. Maori have always been over-represented in the underprivileged, unemployed and unqualified class of citizenry for reasons not entirely, or not even, of their own making. Since the neo-liberal economic revolution of the 1980s and 1990s inequality of income and wealth has dramatically increased and Maori are overwhelmingly over-represented in the ranks of the poor. 33% of Maori have no formal qualifications. Of those in employment about 19.4% are labourers. Then there are the many who may not be in poverty, and may even be employed part-time or full-time but on low wages, and who live above the poverty line but who nevertheless struggle to make ends meet. They tend to be invisible to policy makers but they are probably the majority of Maori. 16.4% of Maori in employment are professionals, and 11.6% managers. This is where the elites reside although not all middle class Maori participate in the activities of the elites. There has been a steady increase in the numbers of Maori joining the socio economic middle class. They include the university educated and those with trade or other qualifications. Qualification seems to be the gateway to the middle class. The middle class is still a minority. About 2.5% earn over $100,000. As in general society the growing inequality of incomes and wealth is reflected in Maori society with just a few individuals and whanau benefitting from neo-liberal political and economic policies. In “The Origins of Corporate Iwi” I noted that there is “a fast growing Maori employment and career sector that did not exist 25 years ago”. It comprises corporate iwi, non-tribal providers, Maori broadcasters, Maori land incorporations, Maori medium education and statutory Maori bodies such as Te Puni Kokiri, the Maori Trustee, Te Taurawhiri i Te Reo Maori and others. It is difficult to determine just how many Maori are employed in this sector but with just 17.5% of adult Maori earning over $50,000 it must be a small minority. That belies the belief held by many that it is a statistically significant sector and that the re-invention of the “iwi” holds the key to the advancement of Maori in general. Most Maori remain in the Poor and Struggling categories. Maori make up 33% of all working age welfare beneficiaries. Whilst the much proclaimed pepeha says, “Ko te kai a te rangatira he korero”, I maintain, “Ko te mahi a te rangatira he kai”. The real rangatira is the one who feeds the people. Work & Income New Zealand (WINZ) is by far the biggest provider for the Maori people. As providers the kaikorero in corporate iwi come a distant last. Alcohol is still a major social problem as it has been since colonisation but we now have other drugs as well. There are many Maori whanau with a member or members whose lives have been blighted by drugs, some to the point where they are seriously mentally ill and institutionalised. In Auckland the gangs are handing out free “P” to 10 year olds, getting them addicted and turning them into customers by the time they are 12. The gangs hang about outside the schools to prey on the young. It’s good business. Alcohol and drug addiction is not solely confined to the poor but poverty is a major factor in substance abuse. And Maori comprise a disproportionate number of the poor. The rate of criminal offending is linked directly to poverty and to the proportion of young males in a community. Maori are again over-represented in both. 80% of criminal offending is committed while under the influence of alcohol or other drugs. Theft is also prevalent among drug users, committed to pay for the addiction. “Maori are being imprisoned at a rate six times that of non-Maori. For Maori males born in 1975, it is estimated that 22 per cent had a Corrections managed sentence before their twentieth birthday, and 44 percent had a Corrections managed sentence by the age of thirty-five”. – Kim Workman and Tracy McIntosh, 2013, “Crime, Imprisonment and Poverty”, in “Inequality: A New Zealand Crisis”, ed Max Rashbrooke, Bridget Williams Books. It is well known that Maori comprise about 50% of all prisoners. Prison is just part of the reality of a great many Maori and their whanau. 33.8% of Maori are aged 15 years or less. Most Maori are young Maori. Whatever our worldview or worldviews they include a deep infusion of the English language and thought as well as the Christian religion, and are heavily influenced by global culture. This should come as no surprise as it was foreshadowed over 60 years ago by Sir Apirana Ngata in his now famous words written in the autograph book of Mrs Rangi Barcham (née Bennett), daughter of the late Sir John Mokonuiarangi Bennett. a ko to wairua ki to Atua, nana nei nga mea katoa”. Your soul to God to whom all things belong”. Regardless of the degree of adoption of European and global cultural mores ethnic identity as Maori is a given, but it should not be mistaken for cultural identity. The data tells us that economic survival could well be of far greater daily concern to most Maori than cultural identity, cultural retention and revival, and cultural values, although the two are not mutually exclusive. The worldview or worldviews of the youthful majority are those that should be more relevant to the future of Maori rather than the worldviews of Maori leaders, policy makers and elites who are the minority, invariably over 30 and mostly over 40. 21.3% speak Te Reo Maori. It is difficult to quantify the numbers of those still living the Maori culture or the modern and evolved version of it. There are some who are steeped in the culture and live it continuously, there are some who live it regularly but not continuously, some who live it occasionally or irregularly, and many not at all. All self-identify as Maori. Nga Ahi Kaa are the keepers of the culture, preserving and practising the tikanga and kawa at the Pa and on the marae, some more enthusiastically than others. Not all of them are speakers of Te Reo although the movement to revive Te Reo through kohanga reo, kura kaupapa and broadcasting has increased its use in areas where it had declined. The Maori boarding schools were for generations keepers of the culture and the language. More recently Maori medium schooling has had the effect of reviving cultural practice at school at least. Some of those students also live the culture at home but some, perhaps many, live it at school but not at home. Almost all of those students also live the mainstream culture. Some culture and language is taught and practised in some mainstream schools. The Kohanga Reo and Kura Kaupapa Maori generation has had a marked effect on Maori society with many of that generation now filling governance, management and other leadership roles in the growing Maori specific employment sector (public service, Maori business, service provision, broadcasting, school teaching and university lecturing). Many of them are also engaged primarily in mainstream society. Maori studies courses at the universities also contribute their graduates to those who live Maori culture to some degree. The Matatini kapahaka competition is the central (but not the only) activity that keeps the modern versions of Maori cultural performance alive and thriving. Maori artists including carvers, weavers, painters, sculptors, dancers, actors and writers are also keepers of the culture and at the same time are actively engaged in the constant evolution of their art forms. Mau rakau is thriving. Those are some of the many ways modern Maori are engaged in aspects of Maori culture. Most of my whanau and hapu no longer live at home. Some began moving to the cities after the Second World War looking for employment and opportunity. We started moving out in numbers in the 1960s during the economic boom when the whanau could afford to buy houses. We could not build at home because of restrictive local body by-laws. By the time we overturned those restrictions in the 1990s most people had left home anyway. We now live in the cities, in Australia, and elsewhere. The paepae on most marae at home have thinned out but the home people keep them warm. Like almost all hapu in Aotearoa we live elsewhere and travel home. But most never make it, except perhaps for tangihanga. I spent eight years 2001-2009 working in the Auckland region where most Maori live. We were working on a Maori development project. We were into Matauranga Maori, Te Reo Maori, Tikanga Maori and all that as the foundation of Maori education. But slowly it dawned on me in Auckland that the dominant culture amongst Polynesian/Maori youth was Hip Hop. That generation born and raised in that 1984-2005 period in Auckland and elsewhere was the Hip Hop generation. Hip Hop is everything – dance, music, art and street talk. It retains the former reggae and roots base, adds in rap and break, crump, gangsta and all that. There is an underlying Polynesian expression in it but its essence is American. My father’s generation loved the songs of Paul Robeson, my generation was into rhythm and blues and rock and roll. This generation is hip hop, all of us down through the generations influenced by the music of Afrika via slavery and Amerika. The difference is that Hip Hop has become a complete sub-culture whereas we were just into the music. It dawned on me that my generation and the next were designing policy and practice based on all the things that my generation had fought for in the 1960s to the 1980s. But it was policy designed for the next generations who had gone somewhere else. The relatively small number who had gone through kohanga and kura were relatively “pure”, culturally speaking, but the rest were somewhere else. This all happened while we had our eyes on the past. Then it dawned on me that that’s what always happens. The next generation always goes somewhere else while the previous generation slips slowly into the past. Now my grandchildren and great-grandchildren speak three languages – English mostly because that’s how you buy your Nikes and order your McDonalds and KFCs and get on in life, Te Reo Kohanga for those who went to kohanga (most of them) but mostly when their mother or grandmother is listening, and street talk the rest of the time, based I think in Te Reo Hip Hop which is a version of English, sort of. When they message me on Facebook I understand them perfectly because they use English English or Te Reo Kohanga. When they message each other and their multitude of friends I’m lost because it’s a mixture of Street Talk and Txt Talk. As ever they’re all undeniably Maori but not the same sort of Maori as any of the Maori of my generation. Sport as we know it today plays a major role in modern Maori culture, across the socio-economic spectrum. We all grew up playing sport, and at our Pa in the days when there were still enough of us living there, we had our own very successful rugby and hockey teams and our own rugby and hockey fields. Rugby Union, Rugby League, Netball, Hockey, Softball, Tennis and Golf are all popular and have been so for generations. It is a mostly collective competitive activity that resembles the inter-tribal rivalry of old, in both Pakeha and Maori cultures. For many Maori, like many Pakeha, sport is the central activity in their lives, whether as participants or supporters. Sport might even challenge religion as the underpinning of the worldviews of many Maori. The interesting thing about “sport” as an important post-colonial cultural pursuit is that it was an invention of the elite British schools. “Games” have been part of most cultures for millennia but the concept of “sport” as an inter-tribal contest, often based in forms of warfare, was invented in schools such as Eton and Rugby. When it comes down to it most Maori, like most New Zealanders, are living in the suburbs and trying to make a decent living for themselves and their whanau, and that consumes their lives. When it comes down to it that is the age old preoccupation of all people; food, clothing and housing and hopefully some leisure time and a bit of spare money to be able to enjoy it. Many Maori in modern New Zealand are not making it. In the digital age it is easy to imagine that the Maori world revolves around the everyday lives, interests and concerns of our Maori whanau, friends and acquaintances on Facebook until you realise that less than 25% of us subscribe to Facebook. We are not yet defined by our online presence as much as by our everyday lives in the suburbs, most often in the poorer suburbs. An explanation of the world. An account of its own “building blocks,” its origins and construction. In pre-European times there might have been near universal agreement about those six areas of belief and therefore a common worldview across Te Ao Maori, with some regional and tribal variation. That is absolutely no longer the case. Maori are now living culturally complex and diverse lives in a totally different socio economic landscape and their worldviews are evolving dynamically in Europeanized and globalized contexts. There is no longer a distinctive and shared Maori worldview. We have moved on. Culture is a modern concept based on a term first used by the Roman orator Cicero: “cultura animi” (cultivation of the soul). This use of “culture” re-appeared in modern Europe in the 17th century referring to the betterment or refinement of individuals, especially through education. During the 18th and 19th century it came to refer more frequently to the common beliefs and practices of whole peoples. In the 20th century, “culture” emerged as a central concept in anthropology, encompassing the range of human phenomena that cannot be attributed to genetic inheritance. It has been described as an integrated system of learned behavior patterns which are characteristic of the members of a society and which are not a result of biological inheritance. Distinctions are currently made between the physical artifacts created by a society, its so-called material culture, and everything else, the intangibles such as language, tikanga, etc. that are the main components of “culture”. Maori culture today can be defined by having at its core Te Reo Maori and Tikanga Maori. The language itself is evolving as nearly all speakers are second language learners with English as their first language. It is adopting thought patterns, syntax and words from the English language, evolving as all languages do when in close contact with other linguistic traditions. 23.3% of Maori speak the language. 76.7% do not. Probably the most authoritative and complete description of Tikanga Maori is in Hirini Moko Mead’s “Tikanga Maori, Living by Maori Values” (2003, Huia Publishers, Wellington). The companion text which contains teachings of the ancestors in the form of proverbs or sayings is “Nga Pepeha a nga Tipuna” (2001, Mead & Neil Grove, Victoria University Press, Wellington). “Tikanga Maori” describes “practices and values that many Maori, a growing number, see as necessary for good relations with people and with the land on which they live. These practices and values make up tikanga Maori, or that which exemplifies proper or meritorious conduct according to ancestral law”, according to Hon Justice Sir Edward Taihakurei Durie in his foreword to the book. What percentage of Maori in 2013 “live by Maori values” or observe some Maori values in their daily lives is not known. It might be close to the nearly 25% who speak Te Reo Maori. Depending on how you define “living by Maori values” it might be a lot more. But the key point is that it is nowhere near universal. Based on Te Reo Maori and Tikanga Maori being the two cornerstones of Maori culture in the modern age it can therefore be said that Maori culture in the traditional sense and even in its modern incarnation is not universally lived and practiced by Maori people. Prior to colonisation the cultural beliefs and practices of the many hapu would have comprised a large part of the worldview prevailing across the whole of Aotearoa, rooted deep in the evolution of the Polynesian peoples and their ancestors across thousands of years of journeying out of Africa and finally into and across the Pacific. Depending on your definitions the two, worldview and culture, would have been practically synonymous. However the individual and collective worldviews of Maori in the 21st Century have been hugely influenced and expanded by contact with the European worldview and culture, and indeed by contact with many other immigrant cultures. Since the contact or colonisation period all New Zealanders, Maori and Pakeha, have had their worldview(s) greatly expanded by the discovery of new knowledge, by the relentless march of progress in almost every sphere of life, by travel, contact and interaction with cultures across the globe, and recently by the steady globalisation of commerce and culture. It can no longer be said that Maori culture, whether traditional or modern, represents the totality or near-totality of a Maori worldview. It can no longer be said that there is a Maori worldview. Most Maori do not live the practices and values of tikanga Maori. Most Maori live somewhere else in the mental and cultural landscape, largely determined by their place in the socio-economic landscape, and by the degree and form of their engagement with the dominant and increasingly global culture. Putting it bluntly, on the one hand there is a general worldview, fostered by the elites who presumably benefit in some way, in which Maori are a romantic re-tribalised society organised within the mythical whanau/hapu/iwi post-colonial construct, living the idealised concepts and values of tikanga Maori, and speaking Te Reo Maori. On the other hand there is the real world of modern Maori – mostly urban, disproportionately represented in the lower socio-economic class and in the prison population, living in poverty or near poverty in poor quality housing, suffering poor health, under-achieving educationally, beset by racism in their dealings with society and its institutions, and at the bottom of society according to most measures. The reality of the Maori condition arises out of a culture of struggle and resistance. It is a struggle against insurmountable odds to make any headway into the mainstream of a New Zealand society of affluence and consumerism, and resistance against the seemingly oppressive forces of the state and its political economy that conspire to maintain that status quo. Over the last two or three generations some Maori have made it into an educated middle class but the Maori middle class is still a minority and it and its idealised worldview is not representative of Maori in general. Maori don’t live in that idealised mindspace created in the academy, in the bureaucracy and in corporate iwi. Maori live in the mindspace created by mainstream society and its worldview; its religion, laws, regulations, political and economic system, schools, hospitals, workplaces, shopping malls, courts, prisons, cheap rental housing and welfare system. That’s where Maori live. Maori live within the mainstream Western worldview and it doesn’t serve them at all well. The idealised Maori worldview of the educated Maori elites doesn’t serve them at all, and never will. This has deep implications for Maori policy. Or it ought to. For the last thirty or forty years policy has been driven by the Maori elites, driven down the Maori development or Maori advancement track of language and cultural revival (including Maori medium education and Maori broadcasting), neo-tribal invention and identity, treaty settlements, business development, and primary healthcare engagement. But that is not where most Maori are. That is where the elites are. If Maori policy were to address the needs and aspirations of most Maori where they are it would tackle first and foremost the hard issues of poverty and unemployment. My intention here is not to denigrate the beliefs and endeavours of the elites or to declare them invalid, for they are perfectly valid in their own context. But it is their context, not that of most Maori. If Maori policy were to address the needs and aspirations of most Maori where they are it would not pander to the needs and expectations of the elites. The elites can and do look after themselves. And they have consumed the lion’s share of Maori policy budgets for the past thirty years, not to mention the dividends from treaty settlements. The burgeoning Maori employment and career sector where they are concentrated has been built upon the capture of resources by the elites. Meanwhile most Maori are under 25 and most Maori of all ages still live on Struggle Street. My readers should understand that I am not saying that language and cultural retention or revival are unimportant. What I am saying is that policy aimed at language and culture should not be confused with policy aimed at overall Maori development and Maori advancement. I am also saying that policy aimed at the development of neo-tribal corporate iwi and at Maori business development should not be confused with policy aimed at overall Maori economic development. I am saying that is not where most Maori are. That’s where the elites are. Hunting, gathering and living with the Dayak. In the time before the Pakeha, in the time before colonisation, before settlement, do we really know how we were. In the time before Abel Tasman sailed into Mohua (Golden Bay) in December 1642. What do we really know about how it was over 300 years ago. Our only term of reference is the here and now, and our own imaginations about how it might have been, based perhaps on a few stories and maybe on some old books, drawings, paintings or even on early photographs. But we don’t know do we. Sir Peter Buck and other anthropologists have documented the material culture of those times and Elsdon Best has descibed the old religion and a great deal more. F.E. Maning and others wrote about the experiences of “Pakeha Maori”. But mostly I think we just imagine what it might have been like. My term of reference is a longhouse in the jungle in Borneo, the home of a group of indigenous hunter gatherers who were still living a mostly traditional lifestyle. I lived with them for a while in 1966. The Dayak are part of the Austronesian people, a broad ancestral grouping that includes the Malayo Polynesians. Although the Dayak people are distantly related to Maori their life and lifestyle were not the same as those of our ancestors. To start with they live in a tropical jungle whereas here in Aotearoa we have the seasons to contend with including the sometimes harsh winters and the winter shortage of food. So food resources are different and food is central to the life of the hunter gatherer. Although similar in origin their religious and cultural practices have evolved on a separate path for a few thousand years. Despite that however there are many similarities in the lives and lifestyles of hunter gatherers everywhere. 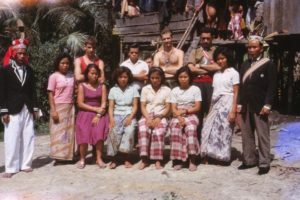 I was in the state of Sarawak in Malaysian Borneo with the 1st Battalion Royal New Zealand Infantry Regiment on active duty during Indonesia’s “Konfrontasi” war against Malaysia. Our job was to protect part of the border between the two countries to prevent any incursions across the border by regular Indonesian troops or by irregular insurgents. Three of our rifle companies were in defended positions near the border and patrolled along the border. Our company was in reserve with battalion headquarters. We were used on various tasks throughout the whole battalion area of operations. As a rifle platoon commander one of the tasks I was given by the battalion commander was to live with the local indigenous Dayak people on a “hearts and minds” mission to gain their confidence as well as to act as a guard platoon across the area I was allocated. The area was thought by Intelligence to sit across an incursion route used by irregular insurgents. There were four longhouses or Dayak villages in that area and I split my platoon into four patrols each one based in one of the longhouses. A longhouse is just that. It is a long narrow house on raised hardwood stilts about six to eight feet high off the ground. It is usually about 100 metres long but there are some that are much longer; up to 500 metres. The longhouse I stayed in was built on a slightly elevated terrace above a small river and about 50 metres from it. A longhouse consists of a row of individual family rooms. There were about 15 families and 15 rooms in our longhouse. Running the complete length of the longhouse in front of the family rooms was a verandah about six feet wide. Each family room had a door onto the verandah. At one end of the longhouse the verandah widened out onto a community deck in place of a family room where various gatherings were held. At the other end and removed from the main longhouse was a balai or round house on stilts. It was the trophy house and single men’s quarters. I sent my other three patrols off to their allotted longhouses and with my six man patrol walked into the jungle to our longhouse. When we arrived later in the day we were greeted as is usual in Borneo by a small ceremony that involved drinking tuak or rice wine. Too much of that stuff can give you a powerful hangover. After the formalities and introductions we were made welcome and shown to our sleeping quarters in the balai. I mentioned that the balai was a trophy house. The trophies were human heads. The Dayak of Borneo had for generations been head hunters and had only in recent decades, we hoped, given up the practice. But they still kept their trophies. During World War II the Japanese treated the indigenous people in Borneo very badly and many of them fought on the side of the allies. We thought that a few of the heads looked Japanese. They would remove the skull then smoke the head until it was preserved and shrunk to about the size of a softball. Then the teeth were sewn back in. The heads hung by their hair all over the rafters, hundreds of eyeless heads looking down upon us. There were too many to hang on the rafters so the rest were in big cane baskets hanging high on the walls. The walls were made of atap or palm leaves and in the evening the breeze would blow through and cool the balai. And set thousands of teeth chattering. We were four Maori and two Pakeha. When we saw where we would be living the Pakeha weren’t the only ones who were white. My guys refused to stay in there. They decided to stay out in the jungle where we usually lived when we were on patrol. I wasn’t very happy about it either but we were there to live with the Dayak according to their tikanga so we had no choice. I was not a popular officer until we got used to it but we slept in there the whole time we lived in the longhouse. No-one got much sleep for the first few nights. Once we were settled in we joined in the routine of the longhouse and became part of the clan. The tuai rumah (rangatira) and his manang (tohunga) took us under their wing and helped us to settle in and get to know the people. In our battalion area there were a lot of Christian longhouses of various types. None of the four longhouses in my platoon area had converted and they were all described as animist or pagan. Their religion was the old indigenous religion. One of the clear differences we noticed between the two was that when we arrived at a Christian longhouse the patrol leader would usually be offered the hospitality of one of the tuai rumah’s daughters. They never seemed offended when I declined their kind offers. That offer was never made in a “pagan” longhouse. Which I thought was an enlightening difference between Christians and “Pagans” in Borneo. Apart from the trophies in the balai there were a few other things that took a bit of getting used to. They kept pigs, dogs and chickens as they traditionally did all over South East Asia, Melanesia and Polynesia. The chickens were eaten but the pigs and dogs weren’t. The dogs were actually sacred animals and were never laughed at or mistreated in any way. It took us a while to work out the role of the pigs but we cottoned on. There were no toilets at all. When you wanted a tutae you went out behind the longhouse and after you’d finished the pigs and dogs would have a kai and clean up after you. Very practical and hygienic. The day would start with a small meal and then everyone would go about their daily duties. Some of the women would sweep and clean the rooms and the verandah, and clean up around the outside of the longhouse, and some would go out gathering food. The men would also gather food and might go hunting once or twice a week. That only took up a few hours each day for the jungle is rich in foodstuffs. The rest of the day might be spent in conviviality or maintaining the longhouse by repairing walls and thatched roofs. Late afternoon we would all head down to the river and bathe before dinner. In the evenings we would all gather on the verandah to eat followed by talking, singing, story-telling and dancing. We were there as a guard platoon so we would also go out on patrol most days for an hour or two. After we got to know and trust our hosts some of them would come with us as our eyes and ears. It was their territory and they knew it intimately. After a while we realised that we didn’t need to patrol because they knew when anything moved in their territory and they would let us know if strangers were coming. Gathering food was the main activity during the day. The two staples in their diet were the tapioca root and sago starch from the sago palm. They were not processed into the small balls like frogs eggs that we buy in the supermarket. Tapioca is also known as cassava, yuca and manioc. It was the only crop that they grew. The root had a purple skin and when they boiled the root for a meal it ended up like a purple slimy jelly that was difficult to eat with your fingers. It was nutritious and a source of energy. For a few days while we were there we helped them clear a patch of jungle and prepare the ground for planting tapioca. It was probably the hardest work we did while we were there but it wasn’t too hard. The sago palm grows wild and about once a week the men would go into the jungle, cut one down and bring it back to the longhouse. The trunk was then split and we scraped out the white pith. It was generally used as a type of flour. Apart from the two staples we ate just about anything that moved including monkeys, snakes, bats and fish. Red ants were a delicacy. We would hold a flaming torch under the ants nest in a tree and catch them in a big banana leaf as they fell out. They would be fried as a crunchy treat for the children and for curious soldiers. But the real delicacy was the juvenile larva that looked like small white huhu. They would be picked off the leaf and eaten straight away. We ate the bananas of course. The women would gather a variety of fruits and berries from the jungle. Our favourite vegetable was kangkong which is a cross between a spinach and water cress that grows near swamps and creeks. When we were on patrol in Borneo we carried our food with us in 24 hour ration packs. It got boring and there was no fresh food so we would always stop to pick kangkong when we came across it. One time we were talked into going on a big hunt. The Dayak men were armed with blowpipes and old shotguns and they wanted us to take our military rifles and the Bren light machine gun, especially the machine gun. Mostly they wanted to see our weapons in action but they thought we might be able to shoot more game than they could with their shotguns. We all headed for the top of a valley and all the young people from the longhouse started down in the valley and drove the game up to us. We shot a few monkeys and when a bear appeared they insisted that we shoot it with the machine gun, so we did. That was the highlight of their hunt. The next night they boiled up that bear and the whole longhouse had a feast. It was really tough but they seemed to enjoy it. One of my guys had done a cooking course. He had brought a supply of flour and a steel ammunition box with him. He made an oven out of the box. His first loaf of bread was greeted with amazement. Not just by the Dayaks. The evenings were enjoyable. The Dayak had two main dances. One was performed by the adult men and it was a fighting dance with their parangs. The parang is a long steel jungle knife very useful for chopping in the jungle and also a lethal weapon. The dance was elaborate and choreographed a fight with the parang. As a dance it was ceremonial but was also used to instruct in the techniques of parang fighting. We learnt how to do it but nowhere near as proficient as the Dayak. The women’s dance was the bilangi and it was a bird dance modelled on some long extinct big eagle. It involved quite an intricate dance step and the women were amazed that I could do it straight away. It was the same as one of the steps we used to do at the local rock and roll dances when I was a teenager! The music was provided by a set of brass gongs hung from a long branch. They ranged from the big one almost as tall as a man down to the small one about 12 inches across. In full performance they could be heard in neighbouring longhouses. The gongs were part of all ceremony, ritual and celebration. The drinking of copious quantities of tuak was also part of ceremony, ritual and celebration. The first ceremony we participated in was the one in which I was granted the status of tuai rumah to sit alongside their tuai rumah. They were probably just flattering me but the ceremony was real. My group sat on one side of the verandah facing the adult males on the other side. The gongs were gonging and the Dayak people were chanting. A live chicken was brought onto the verandah and waved over my head then it was killed and prepared straight away to be cooked. All the while we were served tuak. The drinking went on while the chicken was cooked and while we ate it. During the ceremony they decked me out in a headdress with feathers and with a few other items including a sash I had seen the tuai rumah wearing. A few years later I read an account of a ceremony in Vietnam, 1000 kilometres away, that was exactly the same ceremony. An Australian Army officer was raising and training an army of Montagnard hill tribesmen to fight against the Viet Cong and North Vietnamese. He was working with the Rhade people who lived in longhouses and his induction ceremony was exactly the same as mine. The two groups of indigenous people were separated by 1000 km and a perhaps a thousand years of separate evolution but had retained exactly the same ceremonies. The next ceremony of note was a marriage ceremony. Ours. I mentioned that the so called “Pagan” Dayaks did not offer their daughters as hospitality. But they did have their eyes on us. This evening we were lined up sitting on one side of the verandah, the six of us, and the tuai rumah sat the seven young marriageable women in the longhouse on the other side of the verandah facing us. The ceremony proceeded with the gongs gonging and the young women serving us our food and tuak. Then the tuai rumah sprung his surprise. We were being married and we had to choose a wife each! Quick thinking Ross. So I said there were six of us and seven of them and one would be left out and we couldn’t offend her so thank you very much but no thank you. The old guy just laughed and said you’re now a tuai rumah, you choose two for yourself. A couple of my guys seemed quite willing to comply but I managed to get us out of that predicament without offending the young women or the rest of the longhouse. This whole ceremony was not really about us. In stationary or nomadic hunter gatherer groups there is always a need to refresh the gene pool to prevent inbreeding. To do that the young women would be exchanged with women from other groups in arranged pairings. We presented an opportunity for our young women to be partnered without leaving their longhouse. I don’t think any of my guys later took advantage of the offer but you never can tell. I can guarantee that I didn’t. True e hoa ma, true. While patrolling in Borneo we always carried our medical kit and at the longhouses we visited our platoon medic would treat any minor ailments and wounds. It was a popular service. Any serious cases we came across would get sent out by helicopter, or vehicle if there was a road nearby. We provided the same service at our longhouse. One night a midwife sent for me. I woke up and went to one of the rooms where there was a woman in labour. She was in difficulty and the midwives couldn’t help. So I sent for my medic in the balai and for my radio set. We radioed back to battalion headquarters and had the doctor woken and brought to the radio. The medic described what was happening and the doctor proceeded to diagnose what it was over the radio and to explain the history and frequency of the condition. The woman was in severe muscular spasm around the birth canal and the baby was prevented from birthing. Basically the medic had to massage in exactly the right places until the spasms stopped, and the midwives had to help by encouraging the mother to relax and reassuring her that all would be well. We had the doctor on the radio for about two hours and in the end it was a successful birth. The midwives were amazed. Such is the life of a soldier. We lived in the longhouse for a few weeks and when the time came to leave it was quite sad. We had grown to like each other. I asked the battalion commander to send in a 44-gallon drum of kerosene and a hand pump to fuel their lamps and stoves for a few months. It was winched in by helicopter and was much appreciated. We left a short while later after a ceremony of farewell. As we were leaving the tuai rumah approached me with an offer. He wanted to buy one of my soldiers. He was a tall, young, blonde and handsome Ngai Tahu and the longhouse wanted to keep him to breed from. Tuai rumah offered me 100 ringgit or Malaysian dollars. I accepted and sold him. I don’t know why but Mac would have none of it and insisted that I give back the money. He came out with us. To this day I still give him heaps about reneging on my deal. Some of the longhouse people came with us for a few hours until we reached the road head where we were picked up by truck. The seven young women were among them. Our packs and weapons were carried all the way for us and the parting was genuinely sad. We went back to our regular operations and got on with our patrolling duties and never went back to our longhouse. Just over six months later we were in another war in another country; Vietnam. 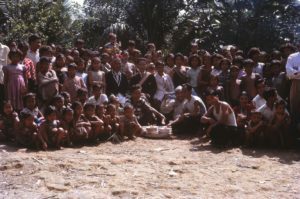 Borneo and our stay in the longhouse was the highlight of my 20 year military career. I was just 22 years old at the time. Many years later as I hear Maori pontificating wisely on traditional life before settlement and colonisation I smile and remember my real experience living the hunter gatherer life as it really was. Cousin God of the Oceans. in this and in every realm. and all who would play with us. With Maui I laugh at the World.